Nearly 400 people are known to have died from encephalitis this year in the Indian state of Uttar Pradesh and neighbouring areas, officials say. But they say that mass vaccinations have kept the figure much lower than 2005, when nearly 1,600 children died. Nearly 10 million children were given a vaccine this year to protect them from Japanese Encephalitis (JE). It normally spreads from mosquito bites and can result in death or brain damage and paralysis. The Uttar Pradesh Health Minister, Anant Kumar Mishra, and the state's top health official, Arun Kumar Mishra, visited the worst affected areas last week. Officials say 386 people have died in hospital this year. Of these, 339 are from Uttar Pradesh, 44 from Bihar state and three from Nepal. They say that Japanese Encephalitis has accounted for only one in six cases this year. However, they have not been able to identify the encephalitis strains in other cases. Uttar Pradesh has no laboratory facilities to examine the viruses, so they have sent samples to the National Institute of Virology in Pune in Maharashtra state. 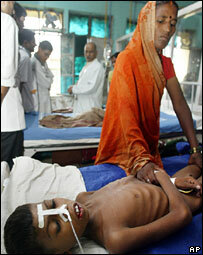 The Uttar Pradesh authorities came under heavy criticism in 2005 for what was seen as their lax response to the outbreak of the disease. Annual floods and water logging are main factors in the increase of the mosquito population in Uttar Pradesh. Deforestation and increasing sugar cane farming have added to the problem.